If you are, then here’s something to really give you some real fright-night heebie jeebies. 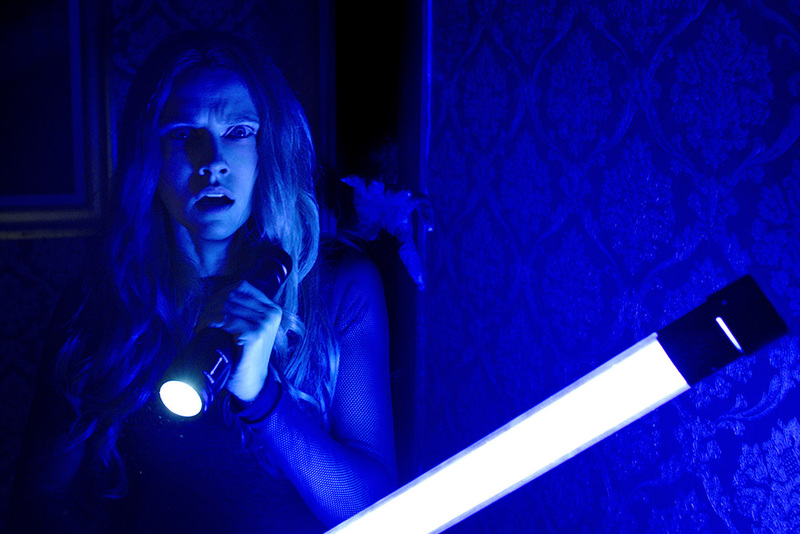 In Lights Out, a family is menaced in a big, old “haunted house” by a beastly figure that shuns light and can only be glimpsed in the shadows of darkness. Lights on, it disappears. Lights off, it attacks. Expanding on his well-received three-minute short film of the same title, first-time feature director-writer David F. Samberg makes an impressive debut, proving you don’t need mega bucks to get maxi scares. Cinematographer Marc Spicer, who worked on Moulin Rouge, The Wolverine and The Shallows, makes the most of every creepy angle, tracking shot and dark blob in the background that might be nothing, or might be something else—something far more menacing, vengeful and deadly. Maria Bello plays Sophie, a mom with serious mental-issue baggage she’s been dragging around since childhood. Teresa Palmer is her grown daughter, Rebecca, who’s moved out, playfully fending off the advances of her amorous boyfriend, Brit (Alexander DiPersia). 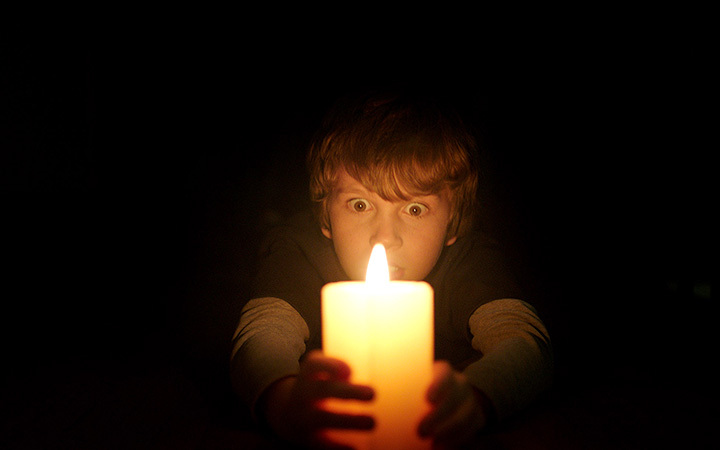 Her little brother, Martin (Gabriel Bateman), is still at home, where he’s losing sleep because he’s afraid to turn out the lights—after he’s seen the frightening, violent figure in the inky corners of his mother’s bedroom. Billy Burke (who plays Mitch Morgan on TV’s Zoo) appears—briefly!—as Rebecca and Morgan’s stepdad. All the pieces of the Lights Out puzzle begin to come together about midway through, when we learn more about the mysterious Diana. I give the movie high marks for story development and making us feel invested in its characters, a rarity in a lot of horror flicks. There’s virtually no blood, almost zero gore, and a fright machine that runs on well-timed gotchas, real-world surprises and supernatural shocks. Some experts think that humans carry an ancient, primal genetic code to be afraid of the dark, a holdover from when we were much more helpless and defenseless after the sun went down—and predators were on the prowl. This movie certainly plays off that idea, and others, too—including madness, family and the fear of going insane. But one of its most clever ideas is the way its protagonists fight to keep the “lights on” in every way possible, as Diana fights to turn them off. Boyfriend Brit’s resourcefulness, in particular, had the audience literally cheering in the screening I attended. These days, you can watch movies many ways: on your TV, on your laptop, on your tablet, even on your phone. But for full effect, see this one in the big, open expanse of a dark theater, surrounded by people you don’t know and by things you can’t see…with the lights out!